addressed key government, economic and business leaders on the opening day of the International Products Exhibition and Conference (IPEC) 2018, at the Doha Exhibition and Convention Centre, in the heart of Doha’s city centre. Held under the Patronage of the Prime Minister and Minister of Interior of the State of Qatar, H.E. 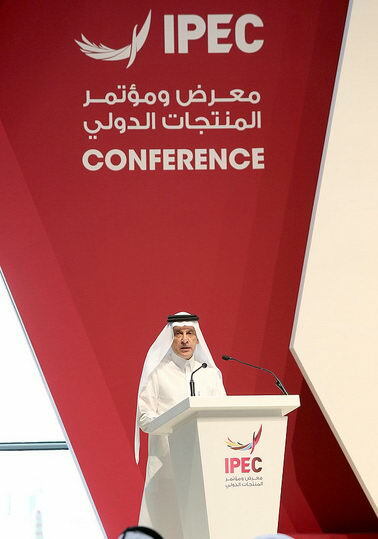 Sheikh Abdullah bin Nasser bin Khalifa Al Thani, the conference’s opening day was attended by senior Qatari government ministers and dignitaries, corporate CEOs, and investors, among others. The three-day IPEC conference showcases strategic projects that aid in achieving national development, as well as facilitate public-private partnerships and joint ventures. It represents an important gateway for bolstering economic relations and accelerating trade across various industries. Foreign investors and business owners attending IPEC can explore first-hand a multitude of investment and development opportunities in Qatar across diverse sectors. H.E. Mr. Al Baker also spoke at a panel discussion titled ‘Strategies and Initiatives Towards National Vision 2030’ The discussion focused on upcoming projects and opportunities regarding the FIFA World Cup 2022, as well as plans for launching new strategies and initiatives in Qatar aimed at fulfilling the Qatar National Vision 2030. Other speakers on the panel included the Acting Chairman and Chief Tourism Development Officer Qatar Tourism Authority (QTA), Mr. Hassan Abdulrahman Al Ibrahim; as well Qatar National Bank (QNB) Group Chief Executive Officer, Mr. Ali Ahmed Al Kuwari; and Qatar Financial Centre (QFC) Chief Executive Officer, Mr. Yousuf Mohamed Al Jaida. Qatar Airways was named ‘World’s Best Business Class’ by the 2018 World Airline Awards, managed by international air transport rating organization, Skytrax. It was also named ‘Best Business Class Seat’, ‘Best Airline in the Middle East’ and ‘World’s Best First Class Airline Lounge’. The national carrier for the State of Qatar is one of the world’s fastest-growing airlines, with a modern fleet of more than 200 aircraft flying to business and leisure destinations across six continents. The award-winning airline recently revealed a host of upcoming new global destinations, including Gothenburg, Sweden; Mombasa, Kenya; and Da Nang, Vietnam.